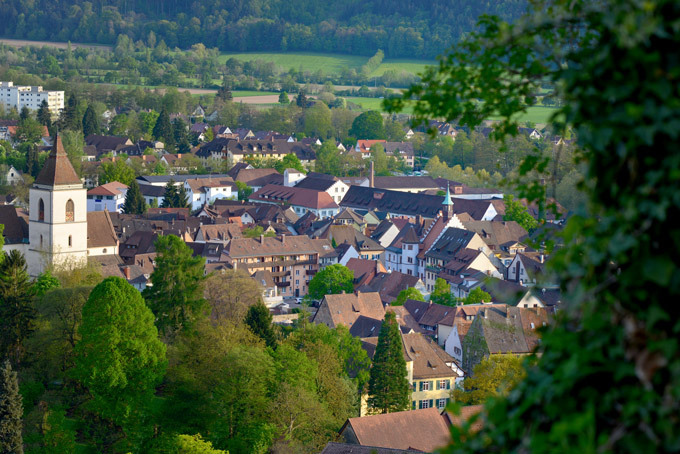 Staufen in Breisgau: the historical city of Faust! buildings tell today of earlier life. The castle ruins overshadow the streets of the old city. Almost all visitors take time to inspect the castle ruins, which have an interesting history and dominate the city skyline. Staufen in Breisgau invites you! The city crest is a shield with three wine glasses. The old streets invite visitors to explore. Many old buildings are colorfully painted and have signs with explanations. Everyone finds the old city to be charming. In the shadow of the old castle, the shops, restaurants and small hotelspreserve the past. All generations meet in Staufen. Shopping is not only for tourists in Staufen! Staufen is especially well-known for its wine. The winestocks and grapevines are everywhere - also on the castle hill. In the Summer, one enjoys many festivals and Germany's best weather. "We are now on the castle hill of Staufen. This castle, which we see here as a ruin, was built about 850. It was then given in the year 1111 as a gift to the Lords of Staufen by the Zähringer Dynasty. It is a very large castle complex. About 1000 people can be sheltered inside the courtyard. The castle itself was destroyed roughly about the middle of the Thirty Year's War, in 1634, because the Schwedes could not fill up their war chest, as no money was left in Staufen. So they simply put the castle to flames out of disappointment." One discovers here the medieval world, Staufens earliest history. Staufen is located in the southwest corner of the Federal Republic, in the vicinity of the university city of Freiburg. This region is called Breisgau and Staufen is its most beautiful jewel. The most famous of all of Staufen's inhabitants was however Dr. Johann Georg Faust, whose life became the basis for many works of literature and art. Because of his supposed magic powers and the legend of his pact with the devil, this figure of Faust - the scholar who died so horribly in Staufen - remains continually fascinating. The truth behind the legend of Faust was his unfulfilled promise to provide the impoverished Lord of Staufen with gold through alchemy. It was religion and not magic powers, however,	which determined life in medieval times. Staufen was a catholic small town, which also had an important monastery for a long time. Unfortunately, almost all documents concerning Faust's time in Staufen burned in the flames of the Thirty Year's War. The history of the magician Dr. Faust was portrayed in popular folktales, published later as the famous chapbook "History of Dr. Johann Faust" in 1587. Shortly before the Thirty Year's War, the male line of the Lords of Staufen was extinguished. Visitors learn from tour guides then about Staufen's revolutionary past during the time of the nationalistic movements in the 19th century. With the exception of Staufen's participation in the failed Revolution of 1848, the small town remained in splendid isolation. The railroad finally reached Staufen - and with it also tourists. After the Staufen of old was discovered by tourists, the city has been able to extol itself proudly as the city of Faust's bloody demise. Staufen was again to experience the misery of war - in 1945. The citizens of the town have made substantial efforts to renovate and preserve the buildings of their city. Good examples are the Lower Castle or City Castle, the residence of the Lord of Staufen in the city, the small hotel "The Crown," one of the oldest of Staufen's businesses, the "Hotel of the Lion," the building in which Staufen alledgedly met his demise, and the Town Hall, with the heraldic crests of those noble families, cities and monarchies connected to Staufen. "Staufen is a medieval small town with a, in our opinion, very pretty city skyline, which dates presumably from the 13th or 14th century. The whole town is overlooked by the castle ruins, which stand on a cone-shaped hill and give Staufen in this way a special attraction. Life in such a small town was not simple in earlier times and it is still not today. We are happy that there are still people who live in the old town, have their businesses, from which they live. The businesses in Staufen have made great efforts again and again to bring customers into the town through special offers. The pedestrian zone, which has existed in the town center for twelve years, contributes greatly to the fact that visitors gladly come to Staufen, enjoy going shopping here. In this way it is possible that people continue to live	in the town. There are also people, of course, who want to live in an old town, without running a business, simply because they love the atmosphere of such a town." No visit would be complete without going into the many fine shops! One can make an excellent start at the Staufener Market. Although this shop may appear small, the quantity of goods is great! "Guten Morgen! Welcome to the Staufener Market!" For consideration there are German products such as baskets, vegetables, fruits, flowers,	cheeses,	meats,	sausages,	pastries,	breads,	soups,	spices,	butter,	yogurt,	quark, honey,	marmalade	and grapes! Especially noticeable are the grapevines in Staufen. From grapes come naturally wine. The vintners play an important role in Staufen; they produce wines which win prizes and enliven many meals. "Now we have then a wine in the glass, it is a Gutedel. It comes from this plot and is from last year. It is a 1996 dry Gutedel Kabinett that we have in our glass, which we will try now. We will first smell it, then we will taste it, try it, and then we will say how good the wine tastes - to your health! To your health!" The wines are naturally sold in the town - and consumed. Another kind of magic power! It is also obvious that one should enjoy a wine tasting in Staufen. Wine, bread,	cheese,	good friends and a thorough explanation of wine making are the ingredients for an unforgettable experience! Staufen is, however, in one regard very modern: the school! "Yes, it is a very large school and it is, of course, difficult to do justice to virtually each participant. We have, on the one hand, the duty to instruct the pupils, to teach them, and on the other hand, however, also to develop the person, the character of the pupils. Therefore, we try to give much over to the individual responsibility of the pupils, that means, we trust that the students, in various age groups, are capable and willing to do everything, which they like to do, very well. They put on, for example, an event for all students,	an evening when the students can make their own music,	Rock music. We call it Rock Café. Or they prepare a sports tournament. Then I can trust, with the help of very few teachers,	that the students organize it themselves. In this way, each student is more or less a good member	of this school and feels responsible for the school. That means, they take care the furniture,	are very careful with the books. We have then no social problems. -	whose friendliness is quite renowned, who make a visit to Staufen so unforgetable. The medieval small town of Staufen in Breisgau is well worth a visit!